Lorena Angulo: I am a cover girl !!!! I am a cover girl !!!! 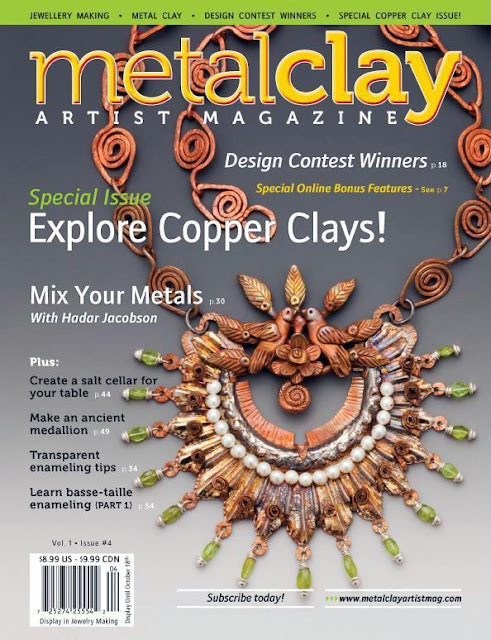 Metal Clay Artist Magazine is the first print magazine created by metal clay artists for the metal clay arts, it has information and projects for all levels of experience. The magazine features a wide range of metal clay-related content and has an international focus, with content, subscribers and advertisers from around the world. Thank You Jeannette Froese LeBlanc, founder of the magazine, and all her staff for this wonderful honor ! i am sooooooo HAPPY for you!!! a celebration indeed! Congrats ! I am so proud of you ! Stunning !!!!! Congratulations! Such a beauty deserves a cover! You sooooo deserve it. Your work is some of the best of the best out there. I love it! Congrats Lorena! Congratulations! Your work is always so incredibly beautiful and oryginal!!! I received my copy and was very happy to see your work on the cover. Very well deserved. You are an amazing artist. Congratulations!! I’m a new follower via Deryn M. Your work is so beautiful..